WASHINGTON (CNS) – Bishops in several European countries issued statements urging Catholics to support Pope Francis in response to a former papal nuncio’s demand for his resignation. Church leaders in Austria, Switzerland and Germany defended the pope and the Church, which they say is being undermined. Similar statements were also recently issued by the Nordic bishops’ conference, which represents bishops in Sweden, Norway, Denmark, Finland and Iceland. Criticism of Pope Francis “comes from circles in the Church who want to get rid of this pope as soon as possible,” said Cardinal Schonborn. He said the pope’s opponents are exploiting the opportunity to criticize him during a time when he is experiencing difficult days. On Sept. 8, Church leaders in Zurich formally denounced Archbishop Carlo Maria Vigano’s demand for Pope Francis to resign for allegedly ignoring sanctions Pope Benedict XVI had placed on then-Cardinal Theodore E. McCarrick for sexual misconduct. They called for all Catholics in the city to pray for the pope during Masses Sept. 9. “The demand for Pope Francis to resign appalls us and strikes us with sorrow,” read a statement released by the Catholic Church of the canton of Zurich. Bishop Felix Gmur of Basel, who serves as president of the Swiss bishops’ conference, weighed in on the issue Sept. 5, according to Katholisches Medienzentrum, Switzerland’s Catholic Media Center. 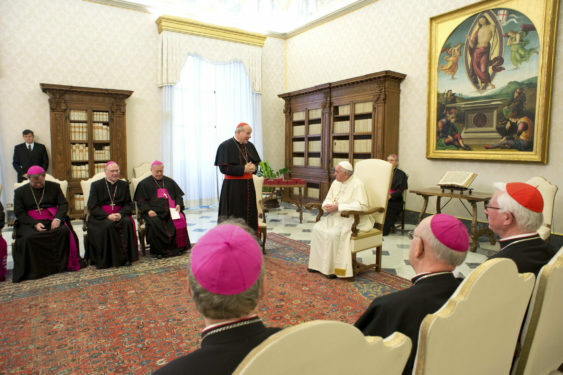 “We do not support a demand for the resignation of the pope,” said Bishop Gmur. In Germany, four bishops previously at odds in the debate over Communion for civilly divorced and remarried Catholics were unanimous in their call for Catholics to remain loyal to the pope. “It is time to stand behind the pope and support his efforts for clarification, restoration and prevention,” Bishop Peter Kohlgraf of Mainz wrote on his Facebook page Sept. 3. 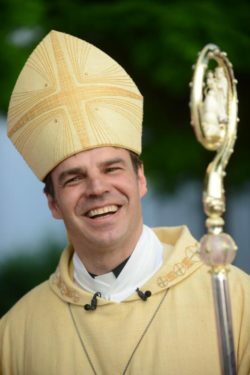 Bishop Stefan Oster of Passau expressed support for Pope Francis in a blog post “Why I believe Pope Francis,” on his personal website. “I must admit that I am familiar with such questions since I have asked them myself,” he wrote. He said he analyzed debates between liberal and traditional Catholics to determine whose side the pope might be on. However, based on the pope’s writings, he said, the pope is neither a liberal nor a conservative. Bishop Oster made a detailed study of Pope Francis’ teachings, reviewing the texts of “Evangelii Gaudium” (“The Joy of the Gospel”), “Amoris Laetitia” (“The Joy of Love”), “Laudato Si’, on Care for Our Common Home,” and “Gaudete et Exsultate” (“Rejoice and Be Glad”). Bishop Gebhard Furst of Rottenburg-Stuttgart announced his support for Pope Francis Sept. 3 on Twitter. “I follow him on the path to renewal of the church, which he has consistently followed since the beginning of his papacy,” Bishop Furst said. Bishop Wolfgang Ipolt of Gorlitz also expressed confidence in the pope’s leadership in early September, saying it is easy for others to cast blame while not having to take responsibility, according to KNA, Germany’s Catholic news agency. The Nordic bishops condemned sexual misconduct by clergy and also denounced “any attempt” to divide the Church from within. “Sexual abuse, abuse of power and internal strife in the highest levels obscure the face of the church,” the bishops wrote. The bishops have called for a special day of fasting in each of their nations Oct. 5, as well as a day of prayer for the pope and the Church Oct. 7, the feast of Our Lady of the Rosary.